Published on December 30, 2018 in Champion Mindset, Inspiration, Motivation, Sports Psychology, Videos and YouTube Videos. 0 Comments Tags: Arnold Schwarzenegger, Motivation, New Year's Resolutions, Work Hard. I don’t care what some might think of him as a person with his personal relationship challenges, I leave that for others to debate. His work ethic is legendary. And he has done it SEVERAL TIMES in multiple, TOTALLY different industries, each requiring TOTALLY DIFFERENT SKILLS. It’s not a bygone era – NOTHING with respect to HARD WORK has changed. You guessed it – the REWARDS today are MUCH greater than they were in “his day”. That is a discussion for another day, another time. For now, get INSPIRED and make 2019 Your Best Year Ever. Set your goals, dreams, aspirations HIGHER. Published on August 29, 2018 in Champion Mindset, Inspiration, Motivation, Sports Psychology and Videos. 0 Comments Tags: Serena Williams, Serena's Father Coaching. This video of Serena Williams hammers it home superbly. Published on August 1, 2016 in Champion Mindset, Fun Stuff, Inspiration, Motivation, Sports Psychology, Videos and YouTube Videos. 0 Comments Tags: Nike Baby Champion Commercial, Nike Baby Commercial. Champions aren’t born, they’re made. Negative Self Talk: Stop It! Published on January 30, 2014 in Champion Mindset, Fun Stuff, Inspiration, Motivation, Sports Psychology, Squash Tips, Videos and YouTube Videos. 0 Comments Tags: Choking, Negative Self Talk, Stop it. I recently presented mental toughness strategies at the East Coast Squash Academy‘s Adult Squash camp organised by squash professional Aaron Frankcomb at Willoughby Squash Club in Sydney. Attended by a wide range of squash players, it became quite obvious that squash is a very demanding sport physically and technically where attention to stroke execution, shot selection and court movement can provide beneficial results. While focusing on technical improvement can yield incremental results over time, today’s lesson can produce INSTANT results and in some extreme cases, a quantum leap forward! Please watch this video and then scroll down. Think back to this video as your pattern interrupt. The first step is to Stop it – then you will need to replace the negative self-talk with something positive. Just like today’s distinction – most players don’t know this stuff! Published on March 27, 2013 in Fun Stuff, Inspiration, Squash and Videos. 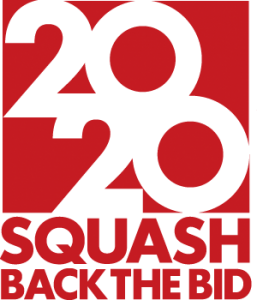 4 Comments Tags: 2020 Olympic Bid, Back The Bid, Squash Olympic Bid, Squash Olympics. Published on July 27, 2012 in Fun Stuff, Inspiration, Motivation, Sports Psychology, Videos and YouTube Videos. 1 Comment Tags: Dr Mike Evans, Exercise, Mike Evans. I know this blog focuses primarily on elite athletic strategies and techniques, but the video below is a MUST WATCH to remind us all of the benefits of exercise. Thank you to Ray Keefe of Successful Endeavours who forwarded this to me. When you come across anything like this, “pay it forward” and send it to me so I can share it with others. Redefining sports – Take 2! Published on March 18, 2012 in Antimimeticisomorphism, Fun Stuff, Inspiration, Videos and YouTube Videos. 0 Comments Tags: Daniel Sedin Pass, Hockey Pass, Ice Hockeyt Helmet Pass. I previously blogged about redefining sports with an endzone touchdown flip that has to be seen to be believed… Today’s blog post is similar, this time involving an ice hockey player who headed a pass like a soccer/football player. What’s going on out there on the playing field?!? Elite athletes are so gifted they are combining all kinds of skills and tricks maybe forgetting they have their cleats or skates on! Fun stuff if you can do it!